Realize Cedar will redevelop the Cedar Street corridor across Delhi Township by improving sidewalks, street parking and roadways on Cedar Street to create a safe, walkable community for all age groups, including millennials, families and seniors. By updating our downtown infrastructure, we will create an atmosphere where residents, businesses and visitors can thrive through improved motorist and pedestrian safety and better traffic flow. This initiative will connect our community in new ways and attract new businesses and developments to our area, create jobs and boost local property values. The Delhi Downtown Development Authority (DDA) is dedicated to helping the business community and residents prosper together. One of the most effective ways we accomplish this objective is through the improvement of our local infrastructure. Realize Cedar will transform Cedar Street into the heart of the community, a place where Holt residents can live, work and shop together. The redevelopment project will make Cedar Street Delhi Township’s “front door,” an attractive place for small businesses, pedestrians and shoppers. Realize Cedar improvements will help create a more livable and walkable community with improved pedestrian and vehicle safety that appeals to all age groups. The project will benefit the entire community by laying the foundation for private investment that will create jobs, spur economic activity and create a focal point for our community. The DDA has funded many infrastructure projects around the area and is constantly searching for ways to make the township better. Funding for these projects does not come from additional tax dollars or special assessments. The township uses DDA funds (recaptured tax dollars that would otherwise leave the township for regional entities), as well as grant funding to finance these infrastructure improvements. There are no new taxes. Thank you for your support and cooperation during the construction phase of this project. We are enthusiastic about Realize Cedar and eager to see the positive impacts it will have on the residents and businesses of the Delhi Township community. 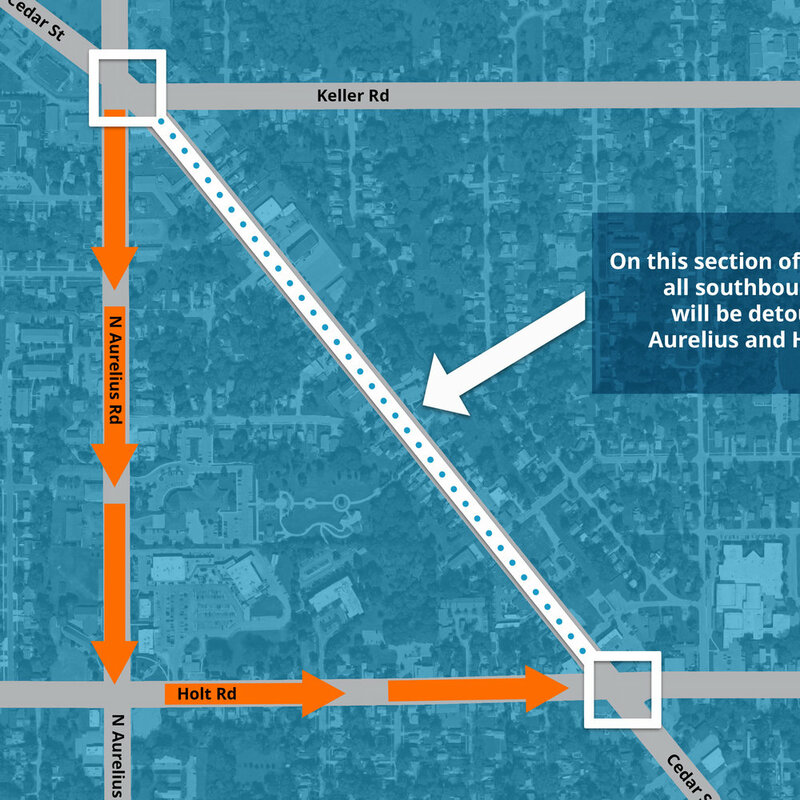 All southbound traffic will be detoured around Cedar Street via Aurelius and Holt Roads. 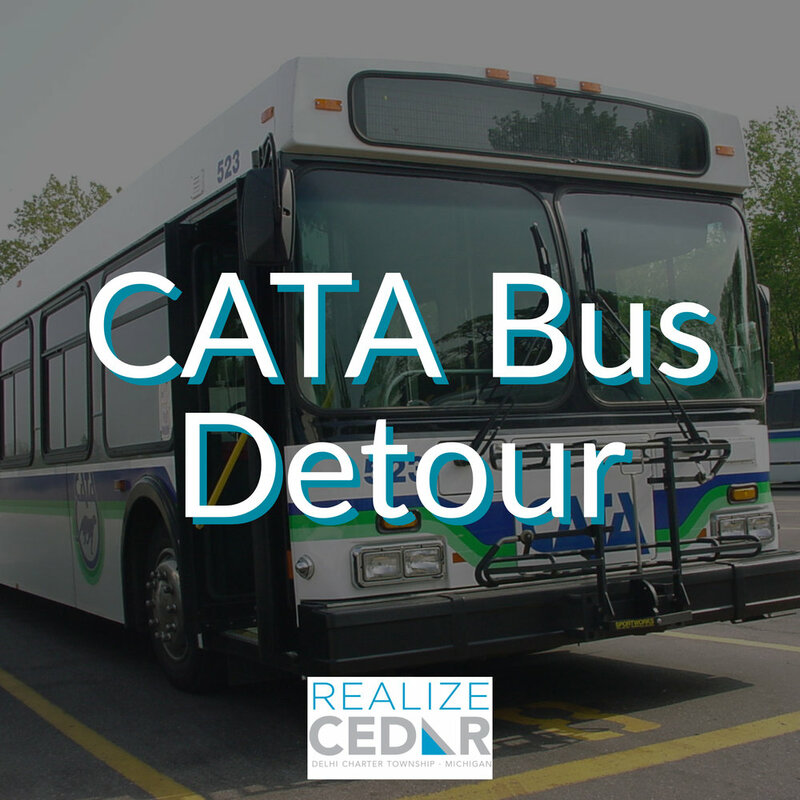 CATA buses traveling along Route 8 will be detoured around the construction zone. Click below to see the route changes and the temporary bus stop locations. A comprehensive look at the Realize Cedar plan from the early planning process to the development framework. Updates will be posted as the project progresses. Check out our Facebook and Instagram pages for photos and videos of project updates!